Sarah Lopez, a built environment historian and migration scholar, is an assistant professor at the University of Texas at Austin. 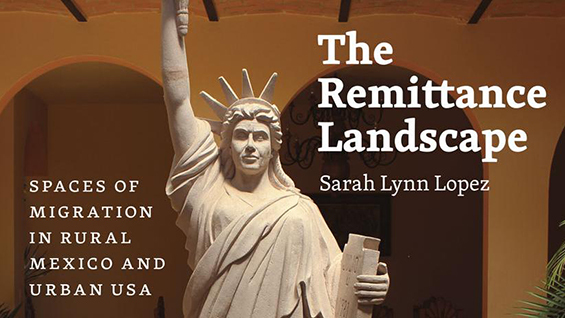 Lopez' book entitled, The Remittance Landscape: The Spaces of Migration in Rural Mexico and Urban USA was published by the University of Chicago Press in 2015 and won the 2017 Spiro Kostof Book Award from the Society of Architectural Historians. Currently, she is researching the architectural history of immigrant detention facilities, a portion of which contributed to the Humanities Action Lab’s States of Incarceration national exhibit. She is also examining the relationship between thirty years of continuous migration between Mexico and the US and the development of an informal binational construction industry on both sides of the border. Lopez was a Princeton Mellon fellow in 2016-2017; she is currently a Snell Fellow and a faculty affiliate with American Studies, the Amos Rapoport Center for Human Rights, and the Latin American Institute. Guillermo Ruiz de Teresa’s research cluster Neighborhood Transformations and New Communities focused on Border Urbanization. He is a Stavros Niarchos Foundation STEAM Scholar currently on his first year of a PhD in Architecture in the Royal Collage of Art. Open to current Cooper Union students, faculty, and staff. Room 315F.